The MODZ Max48 battery charger uses an internal microprocessor to intelligently charge your golf carts batteries based on real-time battery pack capacity and ambient temperature readings. The Max48 also incorporates high efficiency soft-switch technology providing unsurpassed reliability with less power consumption. A simple, easy-to-read status light allows you to quickly assess the state of your battery pack and current charge mode. Never worry again about finding dead batteries after prolonged storage. The Max48 features innovative, plug and forget smart float technology allowing you to plug in your golf cart and leave it plugged in without fear of damaging your batteries over extended periods of time a common issue with many chargers. Simply plug in your golf cart using the included Crowfoot plug and the MODZ Max48 will automatically turn on or off based on your battery back capacity preserving the longevity of your batteries and ensuring your cart is ready whenever you are. 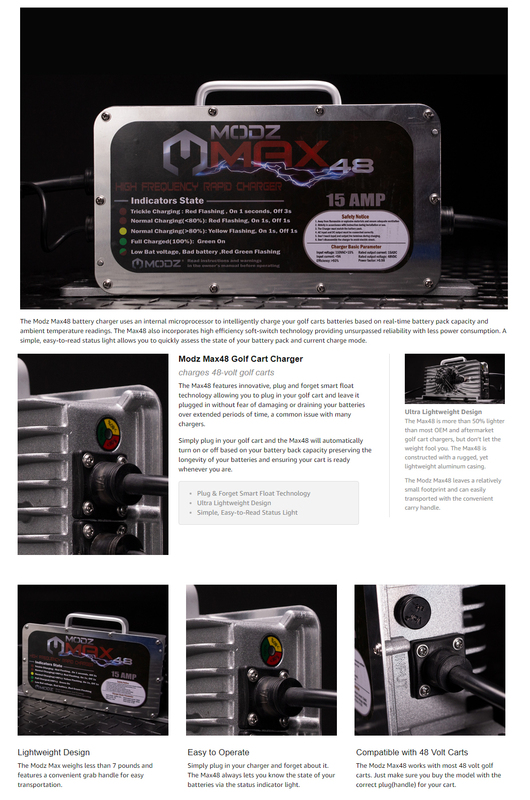 At only 7 pounds, the Max48 is more than 50% lighter than most OEM and aftermarket golf cart battery chargers, but don’t let the weight fool you. The Max48 is constructed with a rugged, yet lightweight aluminum casing providing exception durability. In addition, to being lightweight the MODZ Max48 leaves a relatively small footprint and can easily transported with the convenient carry handle. The MODZ Max48 is built-to-last and backed by a limited one-year warranty.